New Orleans Cajun comedian Justin Wilson has this apparently rare LP full of his cajun brand of comedy. It is difficult to know if this is the same Justin Wilson who is both a chef and a comedian. Although it is likely that he is not Justin Wilson the stock car driver. 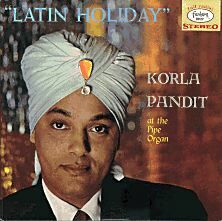 Native of St. Louis, Missouri John Roland Redd (1921-1988), a Latino known by many monacres including Korla Pandit, was not attempting to be convincing when he wanted himself photographed in a turban for an album called “Latin Holiday”. Beginning his career in 1938, he is said to pre-date Liberace in that Redd played keyboard in a similar musical repertoire and has been around since the invention of television. Publicists at the time had fabricated a story about him being born in New Delhi to a father who was a Brahman priest and mother who was a French opera singer.